Then, in the pale morning light, he saw a scrap torn from Shizuka’s bedclothes, stained with threads of her blood and pinned to the wall of their bedchamber by a knife. At once he understood: his beloved Shizuka was not a cruel illusion, as he merely dreaded. She was not gone of her own will, but taken. Fury consumed him, a rage both as hot as hellfire and cold as the depths of the eternal sea. The force of his war cry split the earth asunder, releasing great gouts of flame and molten rock from below, and the stars above trembled at the sound. It is dark. She cannot see, she cannot move… but she can feel, and she can smell, and she can hear. Above and around her, a ceaseless skittering and shuffling of legs, hundreds of legs. Padded feet cross to and fro over her, pressing into her with their weight. Their voices call to each other, some in birdlike chirrups, others in strangled mewling like that of creatures in their death throes. Her prison encloses her body from head to tail, a soft, tight, unbreakable shell that clings and adheres and entangles every last millimeter of her fur. Escape is impossible, for her movement is restricted to fruitless rocking back and forth, a few millimeters in either direction. She cannot cry for help; her voice is too feeble for anything but moans and whispers, her lips and tongue are numb, and there is no one to hear besides… there is only them, the things with the padded feet and alien voices. Her prison seals her eyelids shut, depriving her of even a glimpse of her captors, but she knows they are always there, always moving, even when she cannot feel or hear them. Their smell never goes away: the dry, dusky stench of withered corpses. There is no way to tell how long it has been. The outside, the sunlight, the freedom to move, all those things are fading, distant memories. The passage of time is marked only by periods of fitful sleep, and by the protests of her stomach when the hunger is too much. Usually they hear the noise when that happens, and within minutes, they push an indescribable mash of something past her lips, something with many indistinct flavors. They manipulate her weakened jaw for her that she might not choke. It is never enough; the food—such as it is—is to keep her alive, not satisfied. She is aware that her life is slipping away, despite the feedings. All sensation in her limbs is lost, her muscles have withered from disuse. Even if by some miracle she should be freed from her confinement, she would still be all but paralyzed. When their teeth dig into her, there is only piercing pain for a few moments while their mouth-parts pour their venom into her. The venom always brings with it more weakness, more numbness, melting away her insides little by little. Their mouth-parts drink of the resulting slurry, and when sated, they go away until the next time, leaving her to sink into darkness deeper still. She has come to long for that darkness, for the brief times when she can dream of freedom, of rescue… when the torment of slow death ebbs enough that she can feel the barest glimmer of hope. Hanami collapsed against the black stone wall, her hands pressing her temples as if trying to squeeze the vision out of her brain. This newest waking nightmare was born of someone else’s memories, of one of the many helpless victims that died when she collapsed the ceiling of the spiders’ lair. How it was possible to see and feel that person’s final moments, she did not know and did not care. It was another divine punishment, that much was clear. She killed all those people in the cavern. Whether by intention or not, or whether or not they could be saved, it did not matter. She brought the ceiling down on them… and that was just one of her multitude of sins. The Gods demanded atonement. The Gods put the little voice in her mind, whispering the litany: I should not be here. Soon, she prayed, the Gods would grant her release. No, said the little voice in her mind. Not yet. The time is not right. Wait. “Gen ventured far and wide in search of passage to the realms beyond, for only there would he find the aid he sought. By chance, he stumbled upon a white gate that led him to the depths of the world, to the Beneath itself. There he crossed the dark river to the farther shore, and there he saw Abidokuja, the HellSerpent, the God of Death. As great and perilous and awe-inspiring as the mountain that imprisoned it, the enormous ebon viper awoke from its slumber. Its blazing white eyes beheld an unbelievable sight: a mortal samurai, as lowly before it as an ant before a sentient, who now stood where no living thing had ever dared tread. Unafraid, Gen announced his name and intentions in the sacred manner, unsheathed his sword, and challenged the Serpent to a duel. In the fading afternoon light, all three of them stared at the open scroll, pinned to the floor of Haven Grove with the stem of a sprig of flowers… pale pink sweet pea, with rounded petals curled up at the edges. Rowan sat in the overstuffed armchair he had donated to Hanami months earlier. It was a favorite chair of his and he had been sorry to see it go, but now it brought him no comfort, none at all. His elbows sat on the armrests, his hands folded in front of his mouth, which was a grim, hard line. Only Faun made any sound. She sat in her favorite spot on the couch, head in her hands, sobbing intermittently. Her eyes were bloodshot, raw and puffy with tears. It took ten minutes of Rowan’s pleading and a bucket full of cold water to rouse her from her stupor. At first, she took his words of alarm as some kind of bizarre, alcoholic hallucination. Only when Rowan carried her to Haven Grove and she saw the scroll for herself did realization and guilt come crashing down upon her. “It’s my fault,” she said again. Her voice was husky and broken, absent of her usual brash confidence. “It’s my fault. I was so excited to finally drink with her, I never even thought about why. I’m such an idiot! I should have stopped her, I should have said something! She’s my best friend, I should have known… but I’m just a stinking drunk, a worthless, stinking drunk! Oh Gods…” Her hand flew to her mouth as she heaved. Without a word, Rowan slid the chamber pot to her again. Any other time, he might have made a sharp remark about the consequences of overindulgence. Not now. “The maiden’s name was Shizuka. From that night on, she was a constant sight by Hayaoh’s side. Those who knew of him saw a great change come over the great warrior… gone were his days of fury and bloodlust, gone was the merciless aura that trailed him like clouds. His heart of stone had cracked in two. “Theirs was more than a simple courtship turned romance turned love. ‘Love’ was hardly a sufficient word, for the two complemented and completed each other. As Shizuka filled the emptiness inside Hayaoh’s heart with compassion, so Hayaoh brought out the warrior’s spirit in Shizuka, teaching her the sacred virtues of the samurai. She tempered his anger, and he brought out her courage. He showed her how to fight, she showed him how to make peace. It was a perfect union, with each half enhancing the other to become greater than the whole. In time, the legend of Hayaoh became the legends of Hayaoh and Shizuka… the world watched in awe. “Yet this was not the end of their troubles. When they fought, as all who are in love must fight, their passion shook the earth and rattled the sky, bringing forth rains of bitter tears. Only when they reconciled would the sun shine again. She is born on a farm in mid-autumn, in a small brick house within the Jiburi Grasslands. The house is bordered by rows of green blessed with vegetables and fruits in a dozen varieties, and flowers in countless colors. It is a humble life, a simple life. The farm makes money, but not very much. She learns to tend the fields at a young age. Her parents teach her the Edicts of the Heavens and how to read and write, for they do not have the money to send her to formal school or hire a tutor. She reads whenever she can, whatever she can. Sometimes she hopes for a younger brother or sister to play with, but one never comes. Years pass. Her life is quiet and sometimes lonely, but pleasant. As she grows, her parents tell her again and again the importance of the Edicts, the sacred directives given by Lady Terra, the Goddess of Life herself. She comes to know them all by heart. The Edicts are good, the Edicts are absolute. How could anything from the Goddess be anything but? She spends many days gazing out of her bedroom window, imagining the wider world beyond the seemingly endless fields of green. She suspects she will never see that world, that the farm will keep her here for the rest of her life, as it has kept her parents and grandparents before her. Sometimes she sorrows to think this, but the sorrow always passes quickly. It is good work, important work that she and her parents do. They plant the seeds and till the soil, and the Goddess gives them food and flowers. The food feeds the people, the flowers make them happy. Happiness brings enough money to plant more seeds, and the cycle goes on. Sometimes she thinks that the cycle will continue without end. “When at last the bathing maiden saw Hayaoh on the shore, she did not move. When her eyes met his, he saw in her surprise, confusion, indecision… but not fear. Not a trace of fear. “For what seemed hours, Hayaoh and the maiden in the lake gazed at one another. Neither moved, neither spoke. The moment between them hung suspended in time, growing more fragile and more priceless with every passing second, and neither could bear to be the first to break it. This was it, Hanami knew. It was more than the directions that Faun gave her, more than the familiar tang of oiled steel and old leather than hung in the air about the little cabin. There was a feeling in her heart, a warmth apart from that of the plum wine in her belly… A safe warmth, a blessed warmth. She knew, with no doubt at all, that this was where Zero lived. It was not a particularly well-built cabin, nor was it pleasing to the eye. In fact, most would call it downright ugly. Resting against an ancient oak that served as its back wall, built out of a few dozen old logs cemented together with mud, it was apparent that the whole structure tilted slightly to one side; she noticed that even through her wine-fueled haze. Many of the logs bore deep nicks and divots, the kind that might be made by one chopping them with an old sword without much idea of what they were doing. It had clearly stood here for a while, judging by the thin carpet of moss growing up the walls. The roof was clay mud, clumsily thatched with threadbare straw. A few paces from the front door, there lay a pile of stones in an odd arrangement that she could not identify. It stood about a meter and a half tall, a little like an altar… a closer look confirmed that the stone on the top bore hundreds of scratches on its surface. About two meters away from that, there was something pinned to another tree by a heavy iron nail… now that she recognized. It was a straw doll in a roughly sentient shape, with many stray strands leaking out of its head and chest. A training dummy, and a well-used one. For some reason, she found it charming. “There before him stood a vision from a dream, rising bare from the waters of the moonlit lake, her hair silver as the stars, her eyes dark as ink but warm as sunlight, a doe of such extraordinary beauty that Hayaoh feared his heart might stop at the sight of her. Around them, the forest grew quiet and still. Slowly, slowly. Faun fought to keep her breathing even as she positioned two chipped vials over a dented tin funnel, the narrow end poised over two empty halves of a bombshell, resting on a workbench hewn from an oak stump. An embroidered handkerchief, pickpocketed from a raccoon noble years before, was tied securely over her muzzle and snout. Faun didn’t often exercise caution like this when it came to making her bombs; she was no bookhead like Rowan, but generally she knew how various substances reacted to combinations of flint, gunpowder, and spellstones. When she didn’t know how they would react… well, half the fun was in experimenting. The risk made the end result worthwhile. “Oh, pinch me!” Her ears flattened. Of course. Of course. She corked both vials and laid them down—carefully—beside the funnel, ripped off the handkerchief, and stormed to her front door. Whoever it was had best thank their lucky Godsdamned stars that she wasn’t currently looking for test subjects for the new bombs, she thought. Throwing the door open, she prepared to give the visitor a piece of her mind. “S-sorry, is this a bad time? I’m sorry…” said Hanami, shrinking back from her friend’s fearsome expression. “Hayaoh’s wanderings took him to the great forest of demons in the east, where few dared tread. He was not afraid; all the warriors of the mortal world had offered him no challenge, so why should he fear demons? Lady Nadeshiko Argenteus scowled at the arched marble ceiling of her dressing chamber as if daring it to argue. With great reluctance, she did as she was asked, holding her arms out to her sides. “Thank you,” said Camilla as she fastened each of the straps of Nadeshiko’s ceremonial stola. When finished, she let the pristine white linen drop, and it draped itself around the floris in a pleasing fashion. Pleasing to other people, not to Nadeshiko herself. “All right,” said Naole. The doe’s bush-like tail twitched back and forth, and her hazel eyes shone with anticipation. “One more time.” She pointed to herself. Less than a second went by before the hybrid’s large hands and long, spindly fingers began to move. <Na-o-re.> His gestures were delivered with impressive skill and accuracy… save for that last syllable, which was the closest equivalent. Rendering her name in Old Standard had always been a tricky prospect. “Good. And her?” Naole indicated their new companion, who sat tending the fire as she watched. The flames made contrasting patterns of shadow in her deep blue fur, and danced in the cloudy grey of her eyes. “Perfect!” Naole pounced and seized Legion in a hug, unable to restrain herself. She felt his fur bristle, and wondered if she had startled him… but then his long arms wrapped around her in return, and she laughed, delighted to hear the wheezing barks that meant Legion was laughing along with her. Due to various factors, I unfortunately don’t have a chapter ready for this month… but here’s something of a “down payment” on the next one. This the first official design for our favorite grumpy Vice-Mistress, Lady Nadeshiko Argenteus! I commissioned this piece from the very talented thesilvergoddess, who has an incredibly appropriate name for the task, and who was unfailingly patient as we hammered out the details of Nade’s sword and armor. Please go check out their artwork on their Tumblr at http://tracersgayass.tumblr.com, and maybe commission them or buy them a coffee! At twilight, she wanders through a darkened forest, naked and afraid. When the hour slips between day and night, the ancient woods are cast in an eerie glow of dying orange light that chills her to the bone, for reasons she cannot understand. Nothing is familiar; even her body feels like that of a stranger. This hair, this fur, this tail, all wrong… she feels a powerful urge to tear at herself, at the flesh that slowly suffocates her like a living, breathing prison. I should not be here. The thought trails behind her as part of her shadow, whispering to her the same words every time: I should not be here. No matter how she tries to shut it out, the thought oozes into her ears and sinks into her skull all the same. Faces loom ahead out of semi-darkness. Awash with belief, she runs for her friends, calling out their names, desperate to escape the whispers and the night she knows is coming, closer and closer with each passing second, inexorable, unstoppable. They are her everything, they can shield her from the dark before it falls. The first is a huge but gentle presence, forever on hand with wisdom and understanding, safe and comforting as the fires of a hearth. He smells of iron and embers, of ink, paper, and leather bindings. The second is a bright light and a mischievous smile, sharp and daring, often teasing but always well-meaning, a source of laughter even in troubled times, always an adventure waiting to happen. And the third… the third is dark and mysterious, but she feels for him as she does for no one else. He is her rock. A noble heart for one so troubled, one who faces pain and overcomes it in ways she knows she never can. She calls their names, but there is no sound from her lips. No matter how she tries to shout for them, they cannot hear. In desperation, she throws out her hand. The flower she wears behind her ear twitches… Thorned vines creep down her neck and shoulder and snake around her arm, coiling tight. The thorns break her skin and draw blood… and the vines sail out through space and plunge themselves into the hearts of her three beloved friends. Her blood turns to ice. She screams, but there is no sound. Their chests burst in crimson fountains. Their eyes grow wide with shock and betrayal as they frost over like clouded glass. She can only watch them wither as the life drains from them, bit by bit. It seems to take years before they fall the forest floor… when they do, they strike the loam with impacts that sound like distant thunder. It’s my fault. In the ringing silence that follows, she knows with absolute certainty that that thought comes not from the shadow… it is her own. I should not be here. They crouched together behind an immaculately trimmed hydrangea shrub in the eastern courtyard of Aedis Centralis, the holiest temple of the Silver Order. Located at the heart of Unify, Aedis Centralis was a sprawling, majestic structure, resplendent with white marble and alabaster columns, spotless walls free of the accumulated grime of the rest of the central city, and clean-scrubbed ebony floors polished to an almost mirror-like sheen. At least, that was how it was supposed to be. Three weeks after the Soulsnatcher’s terrible rampage through their most sacred grounds, the Order sistren and brethren still struggled to restore Aedis Centralis to its former pristine glory. It was an expensive and laborious process; scores of those beautiful ebony floorboards had to be torn up and replaced, for they were soiled by the blood of the three dozen that the Soulsnatcher murdered on that night. The Order’s edict for their temples demanded that any surface touched by unjustly spilled blood was forever desecrated and must be disposed of with fire. Squirrel temples had similar edicts, but the sight of piles and piles of floorboards stacked up to be burned on the way inside struck Zero as an awful waste. A waste. That was what the last three weeks had been for him in most part. Though he searched day and night throughout all of Tasakeru for any sign of Naole, there was not so much as a brick-red hair. His little sister was nowhere to be found. If she was even still alive, she was out there somewhere… cold and alone in a hostile forest that even he, a resident of nine years, could barely survive sometimes. Hopelessness crept up on Zero like some insidious disease; it was only his unflagging determination (or stubbornness) that kept him going. The trip to Unify to repay his debt was a diversion as much as anything. It was a way to keep himself going, to relieve himself of at least one burden. Faun insisted on coming along, telling him repeatedly that his constant worry and lack of sleep would lead to his getting caught without her help. At last, after twenty minutes, the Order knights assigned to patrol the grounds left their routes to change shifts. Seizing the opportunity, Zero and Faun dashed across the lawn and pressed themselves against the temple’s eastern wall as if trying to melt into it. They were blocked from view for the most part by rows of flowering hedges, but both knew that it was best to never underestimate an Order knight. From inside there came a war cry, muffled by the thick marble walls but still sharp. It was shortly followed by another, and another, in a regular sequence with precise timing. Moving carefully, Zero stood to his full height and peered into the infirmary’s window. He could not help but grin and shake his head at what he saw inside. Truly, only Lady Nadeshiko Argenteus, Vice-Mistress and Field Commander of the Silver Order, would practice her swordplay in her infirmary room instead of getting the rest prescribed by her healers. A savage bite wound to the shoulder? To her, that was an annoyance at best. 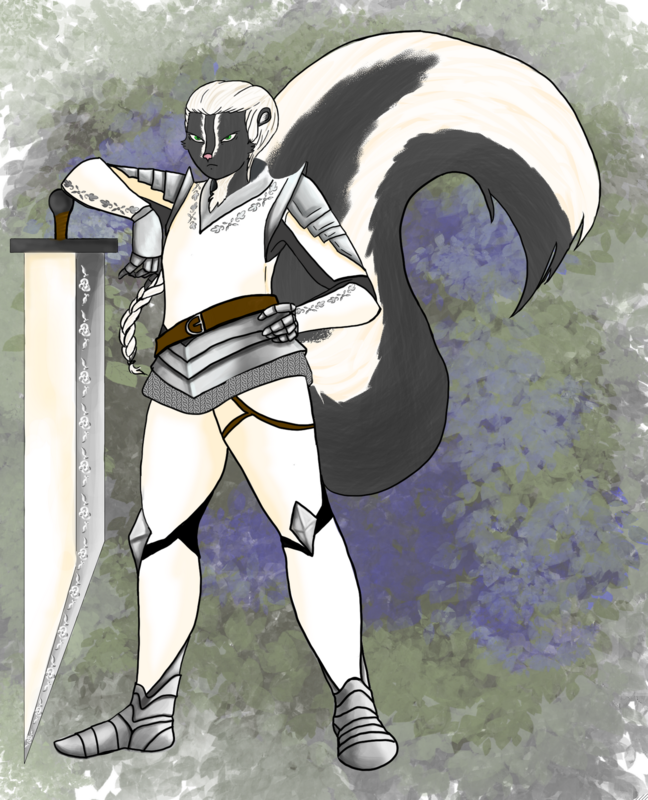 The healers would not allow the young skunk to wear her full armor while she practiced, of course, but Gods help anyone who tried to take her greatsword away from her. Zero watched her run through her form with some admiration, thrusting and weaving the massive silver-edged slab like a weapon a quarter of its size. Her piercing green eyes were set, her breathing even, her striped tail with its single wide white bar held high like a banner. It amused Zero to see that even when under the healers’ care, Nadeshiko took pains to not let a single platinum blonde hair escape from her braid. If it were not for the infirmary gown that Zero was quite sure she was being forced to wear, one might think she had never been injured at all. That impression lasted until one high swing pulled a muscle in her bad shoulder the wrong way. Nadeshiko’s face twisted, and the greatsword fell from her grasp and clanged against the floor as she clutched the bandages on her shoulder. Something that was close to an obscenity formed on her lips, but with the effort of a lifetime of noble upbringing, she suppressed it. As good a moment to interrupt as ever, Zero supposed. He knocked on the window pane. “It was my pleasure.” Zero’s voice turned cold and hard as the marble wall he leaned on. Zero cringed as if struck. “No. I’m still looking for her. Stalker wouldn’t tell me where she was, what he did with her… or if she’s even still alive. I’ve searched everywhere, but…” His sentence trailed off. There were no further words. Two shadows, one black and one orange, raced across the grounds, up the boundary wall, and out of sight. A great urge rose within Nadeshiko to call the knights to arms, if only to find and punish Muranaka for her rudeness… but then, she considered, they would catch Takaishi too. Just this once, she felt she owed him a clean escape. Debts had to be repaid. There was once an island country without a name, alone in the vast ocean, isolated by storms and deadly currents. Its inhabitants knew nothing of any land or people outside of their own, so to them, their island was simply “the world”. In the place of humankind, the animals grew and changed, becoming like man… and yet not like man. Faint echoes of human cultures and ideas unknowingly bled across reality from our Earth to theirs, shaping the growth of the island’s civilization. There were eight of them, eight intelligent species that called themselves “sentients”… eight species sharing a world that became too small for their differing ways of life. It was a world of ancient gods, of long-remembered wars and the heroes that fought them. It was a world of magic and science, logic and emotion, faith and proof clashing against one another. It was a world where the only way to enforce order and stability was to keep the many different cultures separate… and to exile any people deemed too dangerous to coexist with the rest of sentientkind. Unknown to the world, the very exiles they shunned and feared had a part in saving civilization itself. They should have quietly faded from history… but their story refused to be forgotten. They live on as legends, whispers in the wind. Rowan was a scholar, with the body of a warrior and the soul of a poet. Born of the only species with an ironclad code that forbid wielding weapons or causing harm to other sentients, Rowan chose to break both laws, and was exiled as a result… but many suspected that he did not walk this path without regrets. Within his mighty breast beat a heart in conflict, for how would he reconcile the ideal of his people’s pacifism with the need to protect them from danger…? Night and Day, the second volume of Tasakeru, now begins.